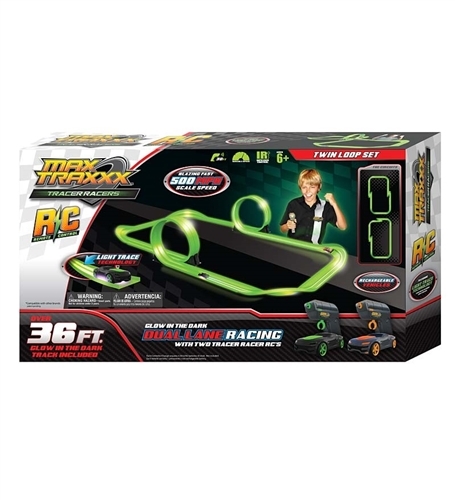 Skullduggery introduces the Max Traxxx Tracer Racers RC Set for 2015. 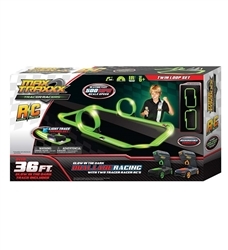 With 2 glow-in-the-dark dual loops, 4 dual glow-in-the-dark corners, over 36 feet of glow-in-the-dark track, and 2 remote control Tracer Racers, racing, in the light and the dark, will never be the same. Set up your own customized racing circuit and compete head-to-head like never before. Tracer Racers utilize Light Trail Technology as they blaze streaks of light on Skullduggery patented Glow-in-the-Dark track. Each Tracer Racer beams down purple light rays from its undercarriage onto track specially engineered to emit glow remnants long after the racer has passed. This exciting racing set and a dimly lit room is all that is needed to set the darkness ablaze.